Alexandria D’Agostino wanted to stand out, so she moved from her small hometown and is enjoying a successful marketing career in Denver. On the advice of her best friend Keira, as well as office pals Natalie and Elliott, she uses the cooking skills learned from her immigrant grandmother and studies the cuisine of each prospective boyfriend’s background to improve her chances at love. Alexandria encounters comical mishaps along the way including one unexpected dinner for three and a meat-focused dinner for a vegetarian. After a corporate restructure somehow driven by new office heartthrob Cameron Grayson, she flies back home for counsel. Will she come back to Denver? Or should she re-evaluate the boy next door from high school? Should she finally admit that being a chef is her true dream? And how does Cameron fit on the menu? Love on the Back Burner had some really good points and I ended up enjoying the story and eventually becoming invested in Alexandria and her life. However, in the interest of complete honesty, the beginning of the novel was a bit stiff. I found the writing didn’t flow very well and there was a lot of explaining of things Alexandria was feeling which could have been shown by expression or conversation. Alexandria herself was sweet and endearing and for the first quarter of the novel I kept envisioning a little lost lamb but it turned out that she had a tough cookie alter-ego at work that wasn’t apparent in her cooking-for-dates personality. I found these two people hard to marry together until well into the novel when her conversations with friends and co-workers exhibited both sides of her nature. The co-workers were great and added a certain humour to the novel that cheered Alexandria up when her dates were going disastrously wrong. And I liked that they supported her many misguided attempts at finding love as did her best friend (who spent the entire novel out of town- not sure why?). I adored her chaotic, interfering family and was a little in awe of her grandmother (I shall not lie- she was tough but loveable). I think I started to get attached to Alexandria when she managed to get home to visit her family, work disaster in tow, and found that she could be buoyed back up by their confidence in her. 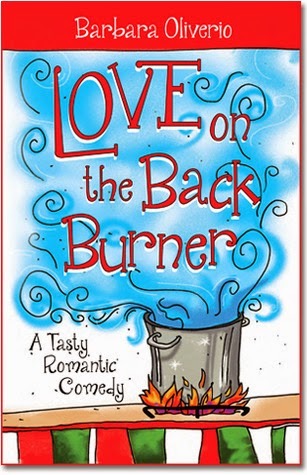 Love on the Backburner is well plotted and the romance is expected but sweet and endearing. All in all, with a little tweaking at the start, this novel could be a brilliant summer read. Am curious to read Barbara Oliverio’s second novel which came out recently!